What are analytical retraceability systems needed for? Where can analytical retraceability systems be used? We offer our clients the option, to extend documentation or IT based retraceability systems by an analytical component. The analytical retraceability is especially well suited for areas in which a solely documentation or IT based retraceability is reaching its limitations and satisfying security, trust, practical feasibility and effective usability can not be guaranteed any more in any case. It can also serve to strengthen the trust in new trade relationships, to give an additional benefit to the own products and to silhouette oneself against the competition actively by a new marketing argument. Last but not least analytical retraceability systems can also be a protection against wrongful regress claims or be used for preventing product piracy and for establishing a line of argument in product piracy cases, respectively. Retraceability by virtue of isotope analysis is generally well suited for all organic products. The different systems have stood the test in practical work already in the area of retracing of food and agricultural raw materials. Moreover retraceability systems become more and more interesting in other areas which deal with organic materials, e.g. in the chemical or pharmaceutical industry. Meanwhile we are receiving more and more inquiries and work orders from very different sectors for solving specific problems by isotope analytics. Retraceability systems can be applied to quite vastly varying scopes and ranges: E.g. just for retracing a single product securely, selected raw materials, a particular production site or for establishing a comprehensive firm/companionship internal or even international monitoring system. We gladly inform you and work out an individual retraceability system for you. Just contact us! You can find comprehensive information about the operation principles and the application of the marking system ISO-ID under the menu entry Marking with Isotopes für Sie zusammengefasst. The isotope analytics is based on a comparison of isotope values of known geographical origin with isotope values stemming from an origin which is under examination. If it can be stated that both isotope values after measurement and analysis are equal according to statistical principles, then it is safe to say that both the reference value from the known geographical origin and the analyzed sample have the same already known origin. The more isotope values of known origins are available in the data base, the better is the comparison basis and the better is the origin determination precision. Every product type has a database on its own which is generated for that product type. Our clients have the option to vary the number of entries ionto the database to tailor the needed effort to their particular needs. The geographical retraceability can refer to continents, countries, regions down to an exact definition of production sites and fields. The retraceability by means of a database offers the advantage that an instrument of retraceability can be commonly build by an interest sharing group, not only by a single company. This is suitable for production companionships association members, members of quality companionships or monitoring institutions. Mutually initiating the creation of a database allows the participating organizations to take advantage of the full database at relatively low costs due to cost sharing. It is possible as well that producers or traders build a database for offering the possibility to their clients to determine the origin of the delivered goods at any time if necessary. This creates a whole new trust level and product security. Very different models can be financially attractive for both sides. storage costs, - effort and - risk cannot be tolerated. A business procures berries for freeze drying from producers in different European regions. The origin of the merchandise is an important quality feature. Reference samples of these berries are collected from all production sites and the corresponding isotope values are stored in a database. As a result, the origin of these berries of a new batch can be verified by testing a sample from the new batch.
. In addition, this measure was employed for quality control for marketing purposes and depicted at www.fruit-id.de to an interested audience. A retraceability solely based on reference samples excludes some of the advantages of a database and inherits a greater risk. However there are areas in which this system represents the best solution. The risk lies in the absence of known reference samples from the laboratory for which of course no isotope values results are available yet. Hence it is mandatory to ensure that the required reference samples of suitable quality can be sent to the laboratory immediately. Factors like poorly validated documentation an labeling, poor stock keeping, deteriorated samples, missing reference samples, lack of time, wrong packaging prior to shipping etc. may lead to the problem that the needed reference samples do not arrive at the laboratory at all, very late, become useless during the transfer or are received without adequate documentation. In some cases, an enterprise is able to accept this risk at own stake an minimize it by suitable measures actively. 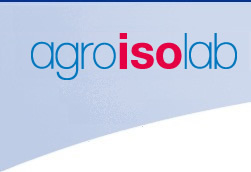 If wished, Agroisolab will check to what extent storing reference samples can be conducted for the customer and issues a corresponding offer. The clearest benefit of a solution based on reference samples is given by lower initial costs because tests are only performed if needed. retracing of complete batches is wished. A farmer grows potatoes and sells his products to the processing industry. He had experienced complaints about the quality of his potatoes in the past and his merchandise was returned to him. The farmer thinks that the returned potatoes did not belong to him. In this case, stored reference samples of each delivered batch of potatoes could provide the foundation for an analytically based line of argument that could help prevent financial losses.